Chef Taran Chadha of BlackSalt, local breweries, Black Kite & Kowloon Bay. and The Tramline Liquor company have teamed up to launch their very own concept restaurant, Salt and Barrel. This concoction of local favourites is set to change the whole game in Hong Kong's culinary scene, and we're here for it! Chef Taran has chosen to focus on our beloved kebab with a twist. He believes that the kebab has been associated with a bad rep... This isn't your average greasy, drunk-me-would-love-this kebab, this kebab uses his unique blend of spices and a modern application of age-old cooking techniques, so we still get to enjoy the traditional flavours and textures. We are going to be enjoying our beloved kebab in a whole new way. BlackSalt will, of course, be keeping their very relaxed vibe, whilst introducing this whole new concept of the history of the kebab. Each new dish will bring a new sense of flavours to your unsuspecting taste buds. The new menu will of course, include some of our BlackSalt favourites alongside these exciting new dishes. Don't worry, we didn't forget about the bar area, the Salt and Barrel bar area will offer 15 taps focusing on serving some pretty incredible fresh draft beer options. They're also including some delicious craft spirits, wines and other indulgent drinks. Chef Taran has even taken inspiration from the different tap offerings when designing his dishes, to ensure that they not only compliment the dishes on their new menu, but also are tasty enough to just drink by themselves. “I always thought kebabs were not appreciated enough. There are very limited places to enjoy a good kebab in Hong Kong and that is why I wanted to expand upon it. The history of the kebab is quite profound. What fascinates me as well is the wide array of kebabs there are. – Chef and Co-Founder, Taran Chadha. Co-founded by Chef Taran Chadha & his wife Sheela, BlackSalt focuses on flavours from his own heritage with a twist, a modern application with inspiration from the Indian subcontinent. He prides himself in using only freshest premium ingredients and homemade masala spices. 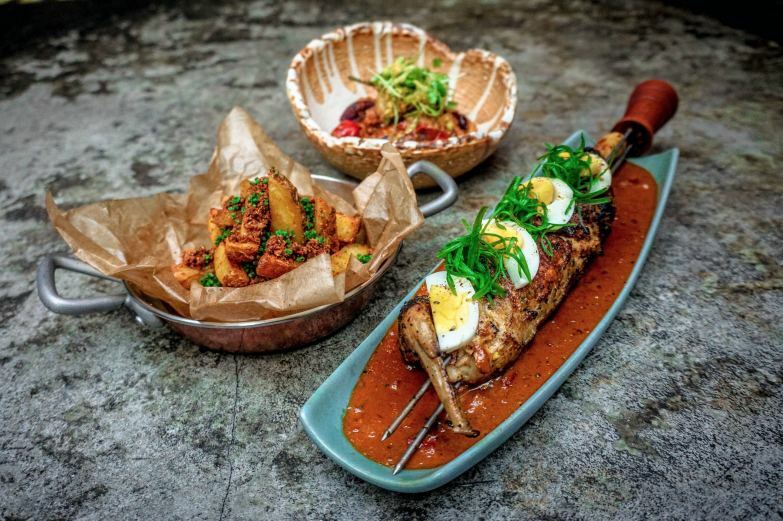 BlackSalt dishes have taken inspiration from Nepalese, Bengali and Sri Lankan cuisine. Hong Kong-born brothers David & Daniel Gallie co-founded Black Kite Brewery. They decided to name their brewery after a well-known and recognised bird in Hong Kong. Similar to BlackSalt, Black Kite Brewery only uses the freshest ingredients from around the world. Co-founded by Ging Van & Mike Bardill, Kowloon Bay looked at encouraging locals to enjoy and consume craft beers. By only using fresh, preservative-free ingredients, the brewery’s range of locally produced craft beer is sold as a premium quality product. Co-founded by brothers Adam & Mark Brough, Tramline is a retail business located in Kennedy Town. They work as a wholesaler offering a multitude of premium spirits, craft beers, wines, tonics and sodas. They want to encourage everyone to drink better quality drinks, and not more.